Lexmark 18C0032 (#32) Black Premium Quality Remanufactured Inkjet Cartridge designed to work in the X3350/ X5250/ X5270/ X5450/ X7170/ X7350/ X8350, P315/ P450/ P915/ P4330/ P4350/ P6250/ P6350 copiers. The use of Remanufactured supplies does not void your printer warranty. Lexmark 18C0033 (#33) Tri-Color Premium Quality Remanufactured Inkjet Cartridge designed to work in the X3350/ X5250/ X5270/ X5450/ X7170/ X7350/ X8350, P315/ P450/ P915/ P4330/ P4350/ P6250/ P6350 copiers. The use of Remanufactured supplies does not void your printer warranty. 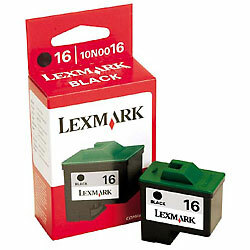 Genuine Lexmark 10N0016 (#16) Black Ink Cartridges for Lexmark Color Jetprinter 153; X75, X1150, X1185, X1270, X2250, Z13, Z23, Z25, Z33, Z35, Z515, Z605, Z611, Z615 printers. 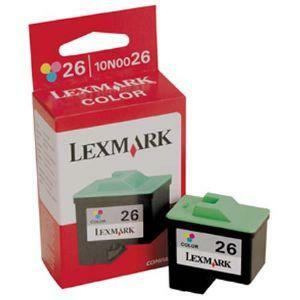 Genuine Lexmark 10N0026 (#26) Tri-Color Ink Cartridges for Lexmark Color Jetprinter 153; X75, X1150, X1185, X1270, X2250, Z13, Z23, Z25, Z33, Z35, Z515, Z605, Z611, Z615 printers.